Quakers are often challenged when people ask us what we believe. Are we Christians? Some Friends would say yes, some no, and many would hesitate—it depends what you mean by “Christian.” Doug Gwyn explores the different stances Quakers have assumed in relation to Christianity, from the unique “primitive Christianity revived” of early Friends, through the foundationist, Conservative, ecumenical, interfaith, universalist, and nontheist positions of different Quakers today. Each of these perspectives makes a contribution to the larger Quaker community, but Gwyn also offers queries testing the limits of each and inviting readers to consider how we are “present-day pioneers in a stream of radical hospitality.” Discussion questions included. 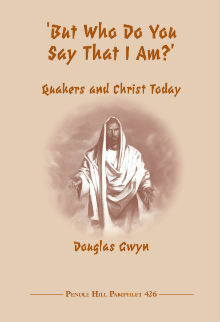 Doug Gwyn grew up in the pastoral stream of Friends in Indiana. After experiencing a call to ministry in 1968, he attended Union Theological Seminary in New York City, where he began to know unprogrammed Friends better. Over the years, he has followed his calling to ministry into work as a Friends pastor, as a writer for the American Friends Service Committee, and as a teacher at the Quaker study centers Pendle Hill and Woodbrooke. His training in biblical studies has informed his research and writing on early Friends and on current issues among Friends today. Doug has coined the term “bispiritual” to describe Friends like himself who are engaged and nurtured by both pastoral and unprogrammed Friends, in different ways. His wife, Caroline Jones, is a Friend and dharma teacher in the Insight Buddhist tradition. Doug currently serves as Quaker Studies Teacher at Pendle Hill. His books include Apocalypse of the Word: The Life and Message of George Fox (1986), The Covenant Crucified: Quakers and the Rise of Capitalism (1995), Seekers Found: Atonement in Early Quaker Experience (2000), and Conversation with Christ: Quaker Meditations on the Gospel of John (2011). He is currently completing two books, a history of Pendle Hill and a study of Quaker faith and practice as they contribute to a sustainable life.